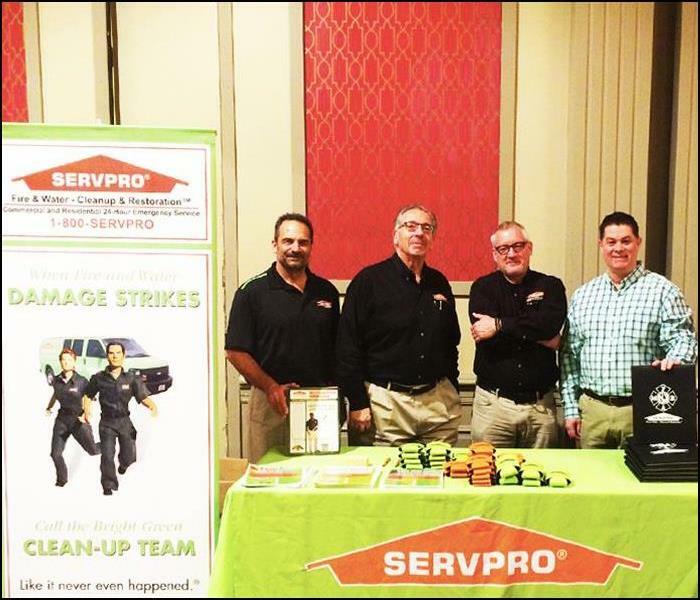 Owner, Jack Oliver (pictured left), takes the day to attend the New Jersey Firefighters Mutual Benevolent Association Conference in Atlantic City, partnering with two other SERVPRO Franchises. 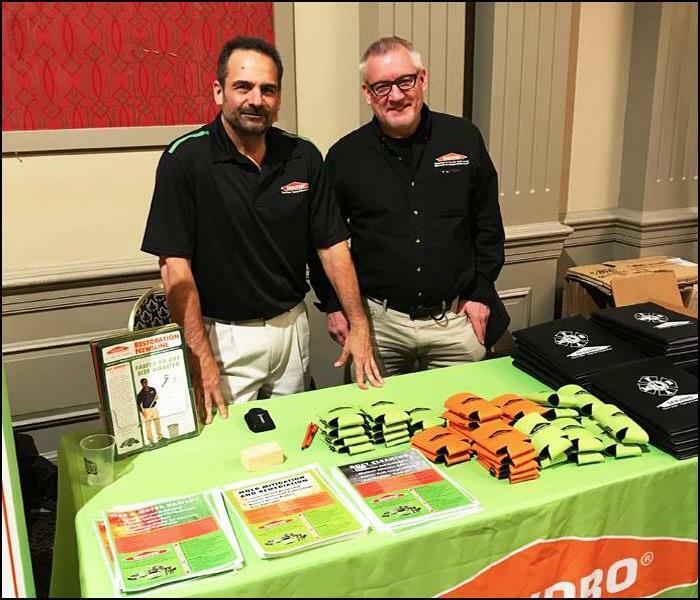 SERVPRO of Northern Sussex County Owner, Jack Oliver (pictured left), at the New Jersey Firefighters Mutual Benevolent Association Conference in Atlantic City, partnering with SERVPRO of Western Essex County, and SERVPRO of Egg Harbor. Contact us at 973-383-2024 if you have a service need or click here to visit our website to learn more about SERVPRO of Northern Sussex County's System Services. 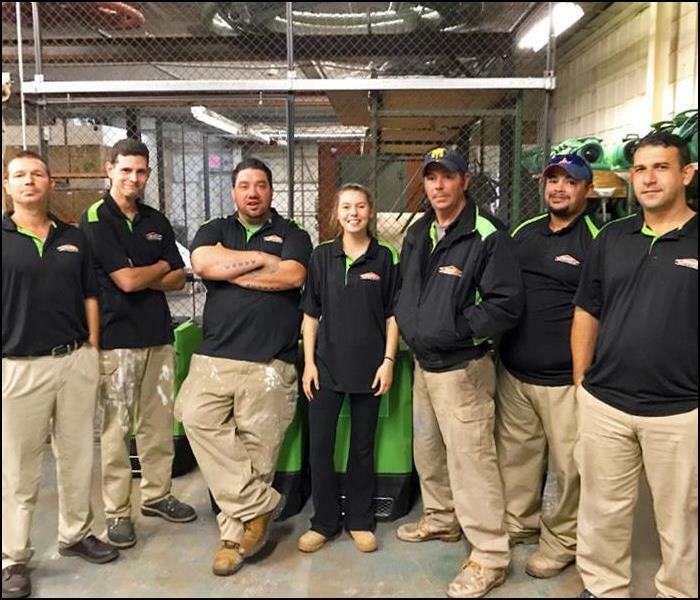 SERVPRO of Northern Sussex County welcomed Tiffany to the Production Team this past fall. Tiffany started out as a temp during the summer, and was hired as a full time technician in September. 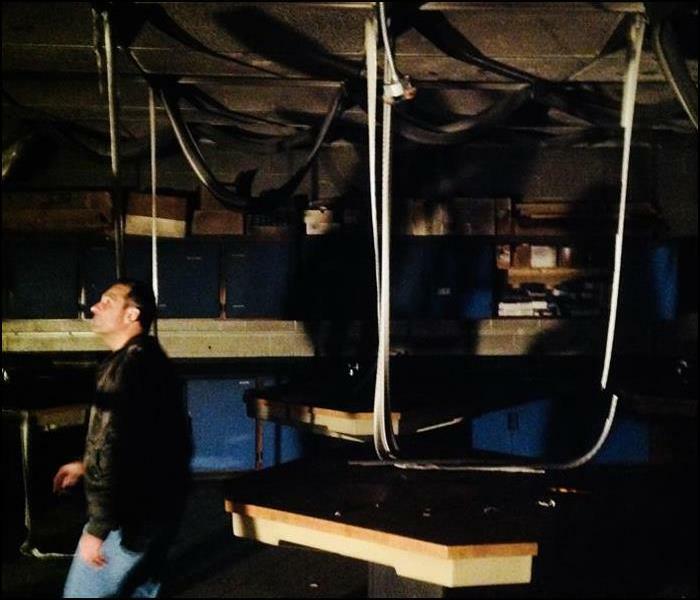 SERVPRO of Northern Sussex County’s Owner, Jack Oliver, and Crew arrive on the scene early Saturday morning to inspect an Emergency Fire Damage located at one of our local area high schools to get the clean-up process started. 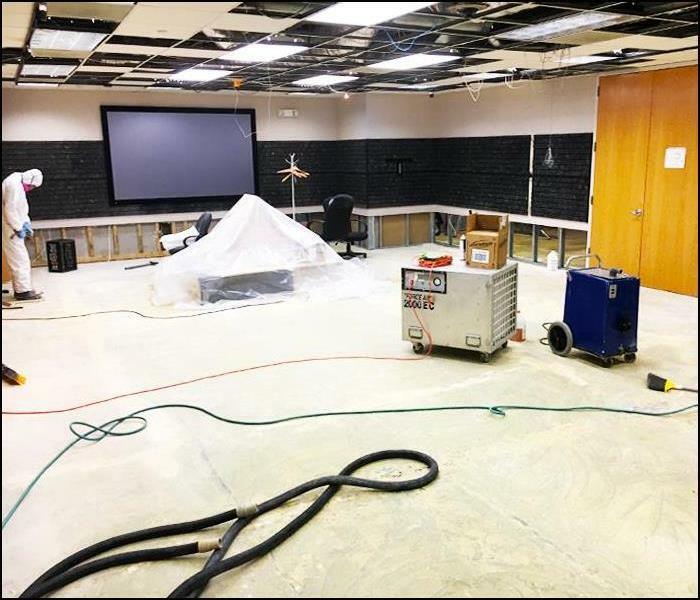 This image show’s one of SERVPRO of Northern Sussex County’s technicians working during part of a commercial mold remediation cleanup inside of the building’s tv showroom. The affected hazardous moldy drywall has already been cut out and disposed of prior to cleaning. 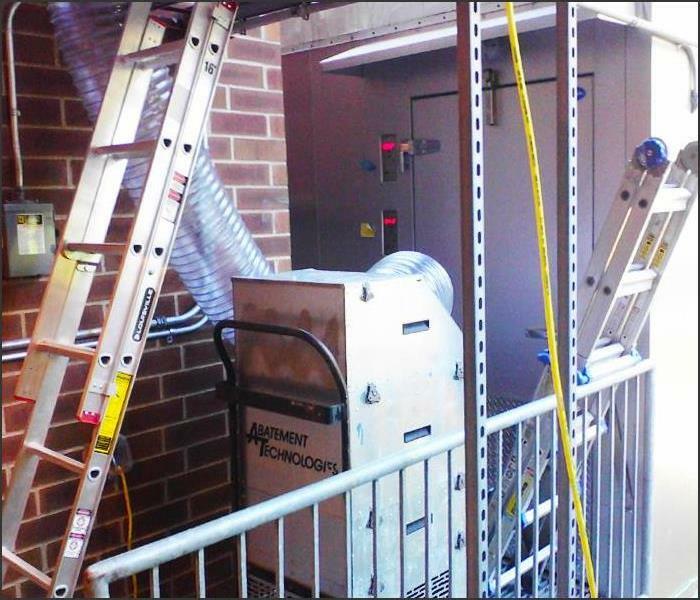 A negative air fan/scrubber is being set up within the space as part of one of the mold remediation steps. A large scale water damage and mold remediation restoration project was organized and performed by SERVPRO of Northern Sussex County after an occupied commercial building suffered several heavy roof leaks during rain storms, and a pipe leak. 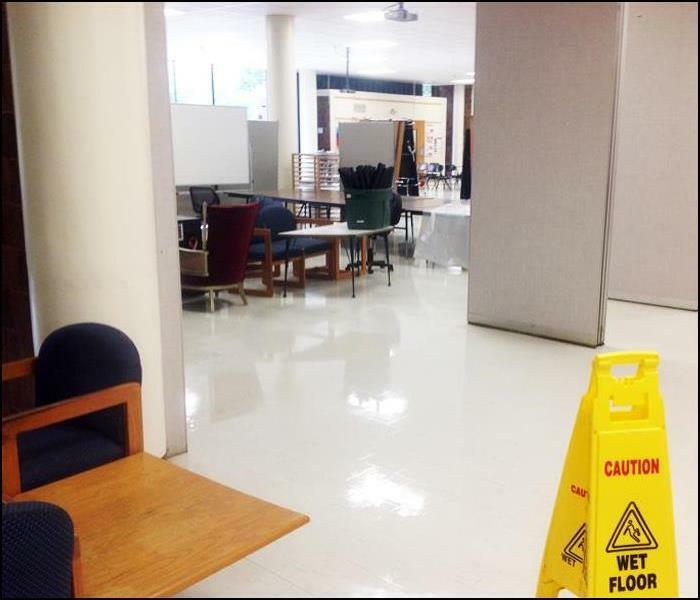 Due to previous water damages, mold had already formed throughout the building. 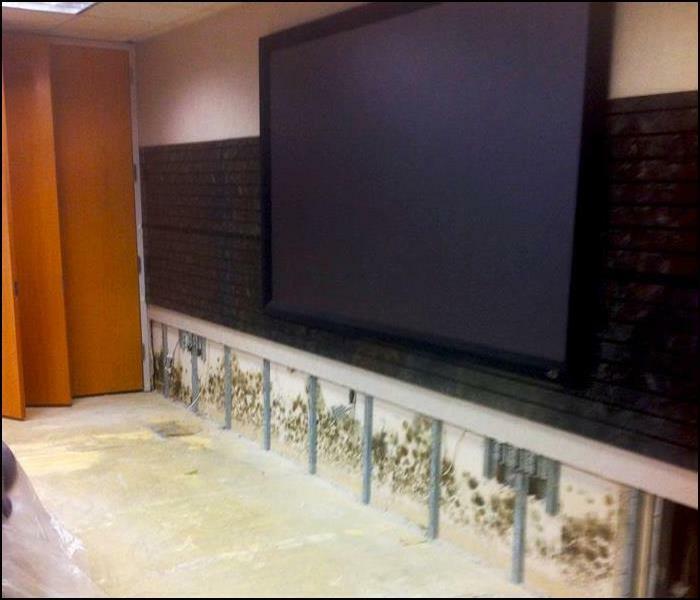 Seen in this image is mold formation inside the building’s tv showroom at the beginning stages of the remediation. Seen here, our technician Daniel is in the process of cleaning soot and smoke residue off of a hard to reach ceiling loft area after the home suffered a serious puffback. The aftermath of a malfunctioning furnace puffback can leave walls, ceilings, carpets, furniture, drapes, and contents coated with a fine film of smoke and sooty streaks, sometimes throughout an entire home. Cleaning up the mess is not a job for the amateur. 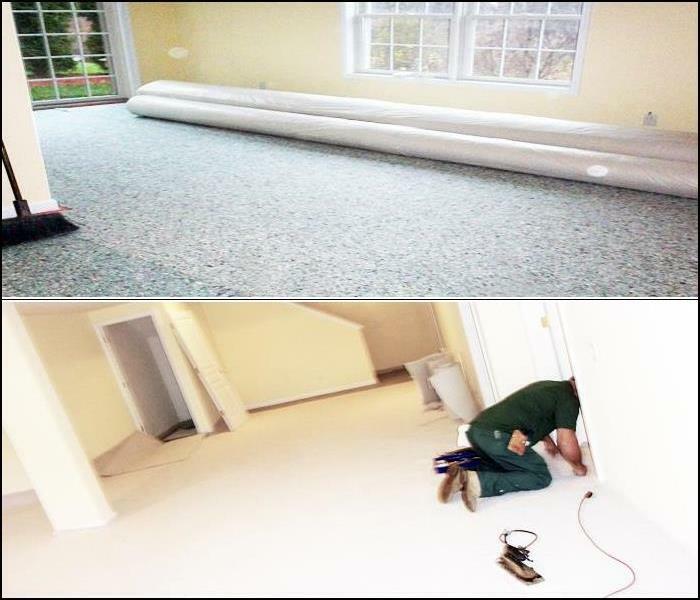 SERVPRO of Northern Sussex County provides experienced technicians, trained to use specialized equipment, and techniques during the complete removal process of all damaged surfaces. SERVPRO performed mold remediation work in the 3rd floor space of this residential attic. 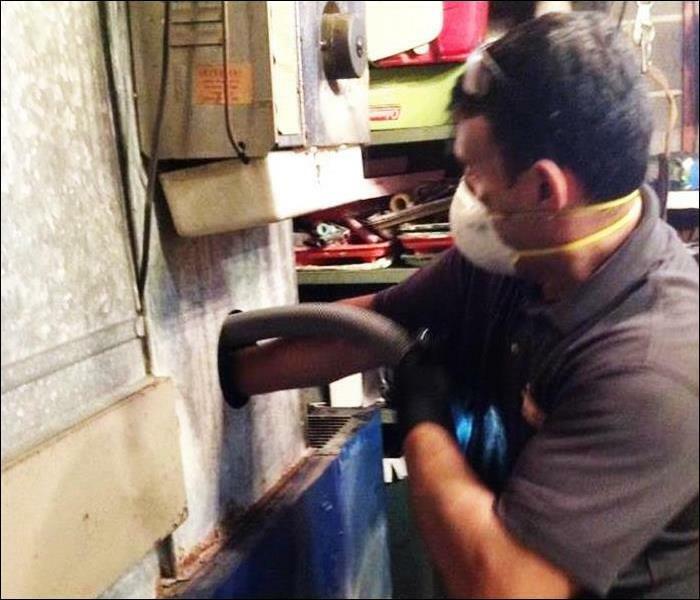 Heavy cleaning and HEPA-vacuuming of the floor, stud walls, and roof joist systems was thoroughly performed to remediate the mold growth while operating a negative air fan scrubber, with HEPA filtration and negative air exhaust fans, within the space. The affected areas were treated with an antimicrobial agent and 1 coat of an antimicrobial sealer was applied to the stud walls and roof joist system to prevent future mold growth before the rebuild could begin. 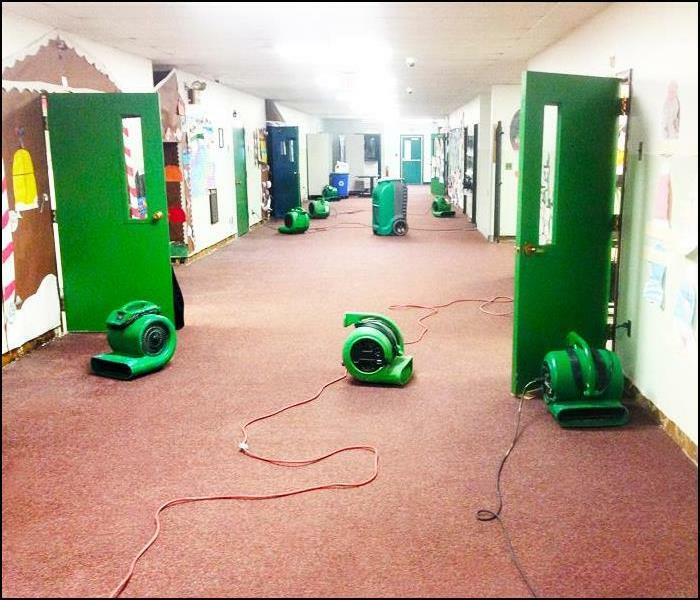 When a frozen pipe broke and caused an unexpected flood in the computer room of a local school, SERVPRO of Northern Sussex county was called in during after-hours to respond to the emergency water damage, which soaked the classroom’s carpeting beneath the computer equipment. 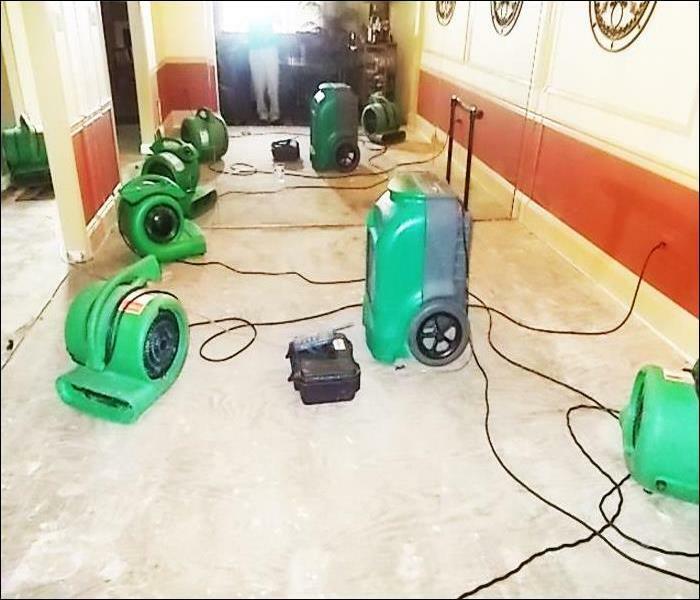 Our technicians immediately extracted the water from the carpeted floors, applied an anti-microbial agent, and set up air movers with large dehumidifiers to provide 2 days of drying to prevent any mold formation from occurring. Pictured here is the classroom’s wet carpeting during the dry-out process while preparing to reopen the room for class use. 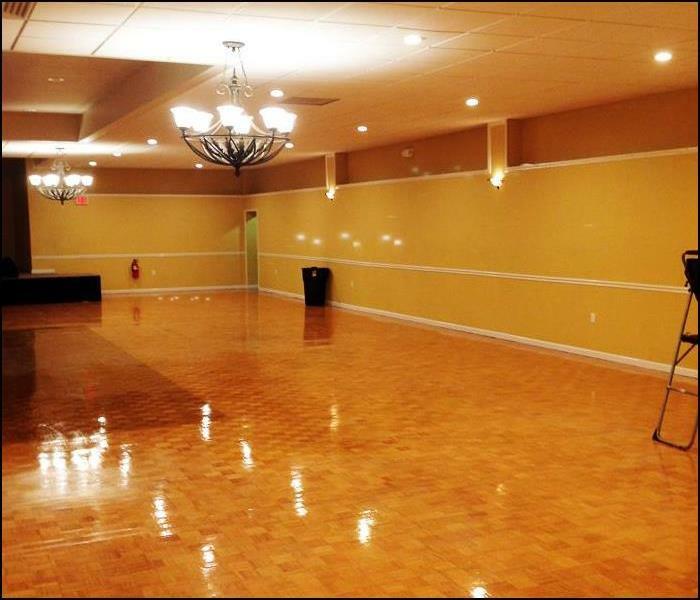 SERVPRO cleans up and restores this commercial banquet hall after a fire caused heavy smoke and water damage to the building. EMS crews were required to get this cleaned up quickly so that scheduled events would not have to be cancelled, and parts of the building could remain open for operations. SERVPRO of Northern Sussex County Technician working on a basement mold remediation project in North Haledon, which required detailed hepa-vacuuming throughout the many stages of this job’s process. A long-term water softener leak caused significant moisture damage throughout this home’s basement. After visible surface mold began forming on interior doors, sheet rock, and molding, an entire basement mold remediation was necessary to ensure the health and safety of the home’s inhabitants. This included some initial demo work to expose the underlying spaces, and an entire rebuild of the affected areas, after the mold was cleaned, eliminated, and sanitized from the structural surfaces. 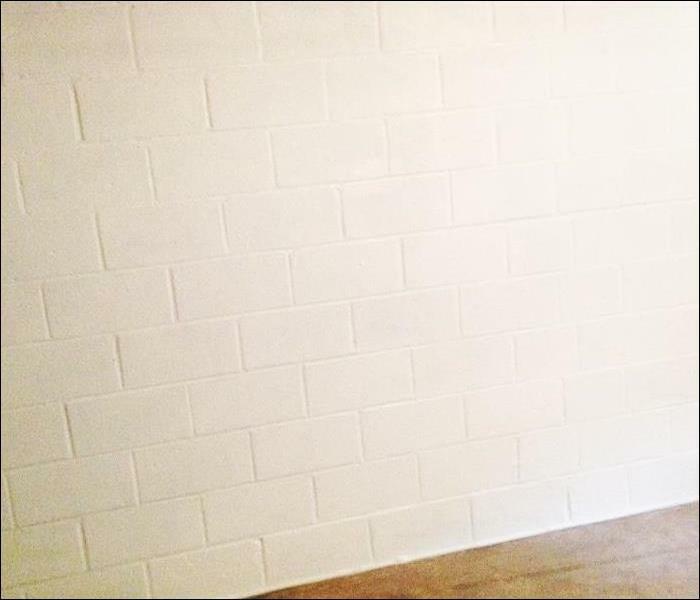 After SERVPRO performed mold remediation in the basement due to previous moisture and storm ground water infiltration through the cinder block foundation walls and windows, Drylock paint was applied to the basement walls to prevent any future water or moisture from re-entering the area due to extreme rain storms. In addition, the customer was also advised to have someone install basement window well covers, use a basement dehumidifier, and repair a broken gutter pipe. 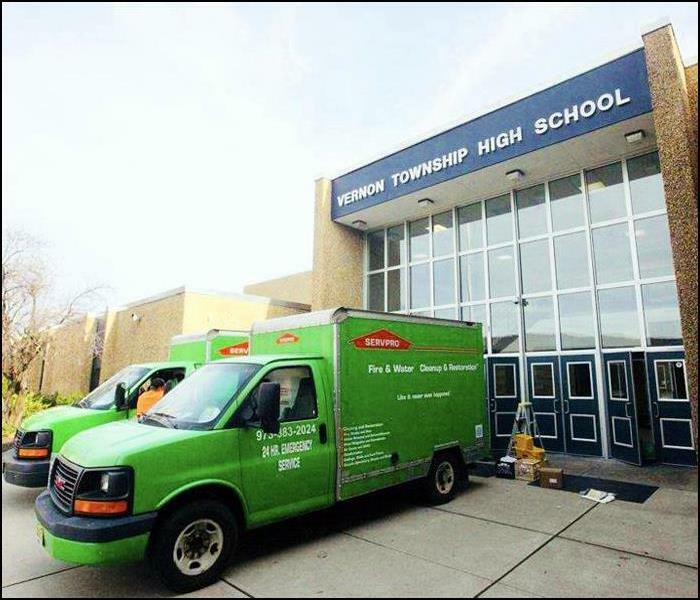 SERVPRO of Northern Sussex County provided emergency water extraction and dry-out services at this local school after an unexpected flood occurred to prevent the start of fast mold growth. Pictured here is one of the steps in the dry-out process after water extraction. SERVPRO of Northern Sussex County cleans up and dries out this residential space after a broken hot water heater flooded the home. 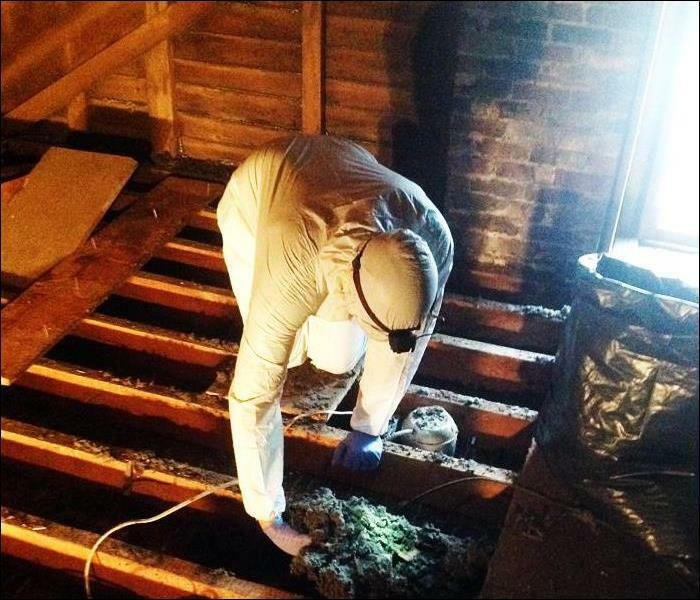 In this case, the soaking wet non-salvageable floating floors, and underlayment were immediately bagged and disposed of before damaging mold growth could set in, and also possibly affect the walls. An antimicrobial agent was applied to the affected areas, and the appropriate number of air movers and dehumidifiers were immediately set up to dry-out the space. One of our Emergency EMS Crew Teams quickly responded to clean up and dry-out this residential water flood damage, caused by an unexpected broken hot water heater that leaked water into the home's Dining Room, Living Room, Kitchen, Hallway, Foyer, and Furnace Room. SERVPRO of Northern Sussex County offers rebuild services. Here a technician installs new padding and carpeting in the finished basement of this home, after a water damage occurred due to a hot water heater leak. Although SERVPRO always tries to dry-out, clean, and restore the existing carpet, in this case the carpet was non salvageable. FASTER TO ANY SIZE DISASTER. SERVPRO of Northern Sussex County’s Production Manager, Brian, responding to an Emergency After Hours Service Call for a past Water Storm Damage Flood at a residential basement, located in Pompton Plains, NJ. 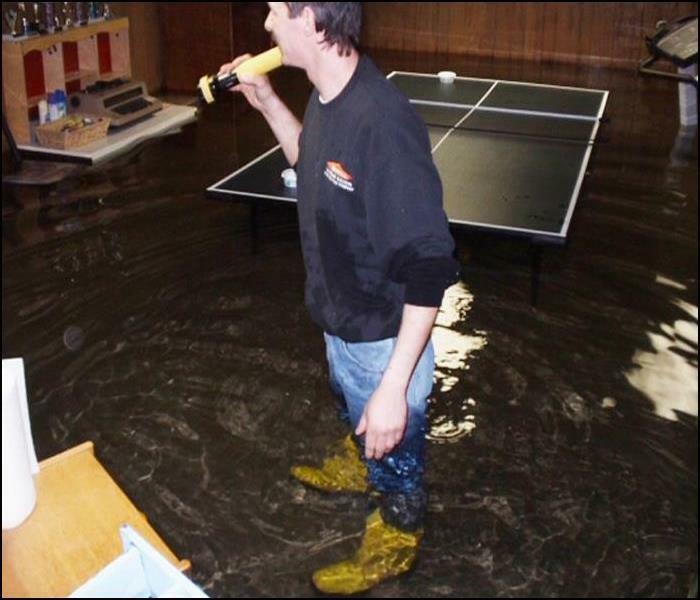 When a Storm or Flood hits your home or business, and you need help immediately, our highly trained water restoration technicians are available 24-7, prepared with the proper equipment, experience, and specialized restoration techniques to get the job right. SERVPRO of Northern Sussex County boarded up this residential home, for a past job located in Stockholm, and tarped the open roof and wall areas that were severely damaged by a fire. We later also provided services to remove the smoke and soot damages from the ceilings, walls, and other surfaces of this home. The steps listed below illustrate our process for the “typical” fire damage emergency. This customer was in the process of selling his home when the required home inspection determined that there was suspect mold growth located on the underside of the attic roof sheathing and rafters. The home sale could not move forward until the suspect contaminates were completely removed and proper clearance by an industrial hygienist was passed. SERVPRO of Northern Sussex County needed to work fast to get this home sale back on track after the cause of the problem was fixed. 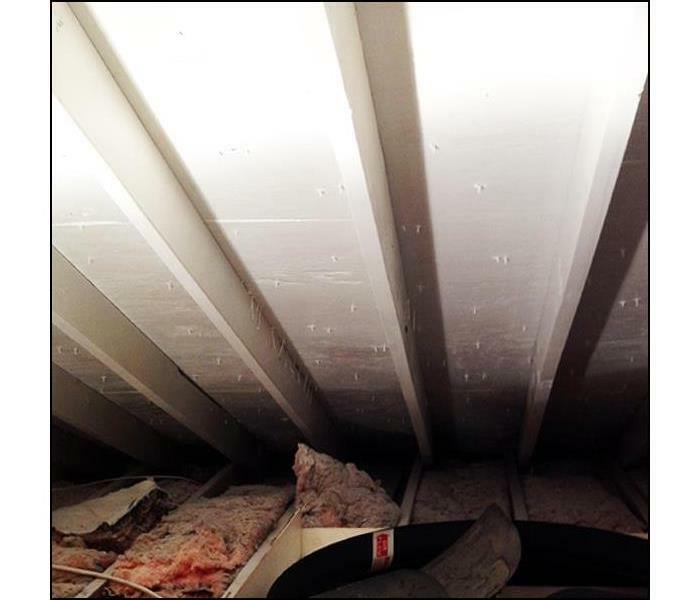 This job required extra heavy Hepa-vacuuming and cleaning of the underside of the roof sheathing and attic joist system, along with the application of an anti-microbial agent. As a visual aid/benefit the customer requested that a white colored seal coat be applied. An anti-microbial fog by a ULV wet fogger was done as a last step to ensure that all of the areas were properly treated. These were the tight quarters our technician, Daniel, worked in to clean the duct system at a Hamburg NJ fire. Our technician is seen here cleaning the main trunk line of this homes ventilation system. Detail cleaning from a puff-back smoke damage in a Vernon NJ home. A puff-back occurs when a furnace misfires and pushes smoke throughout the house. The methods and cleaning products used to clean a puff-back are almost identical in cleaning a fire damaged home. 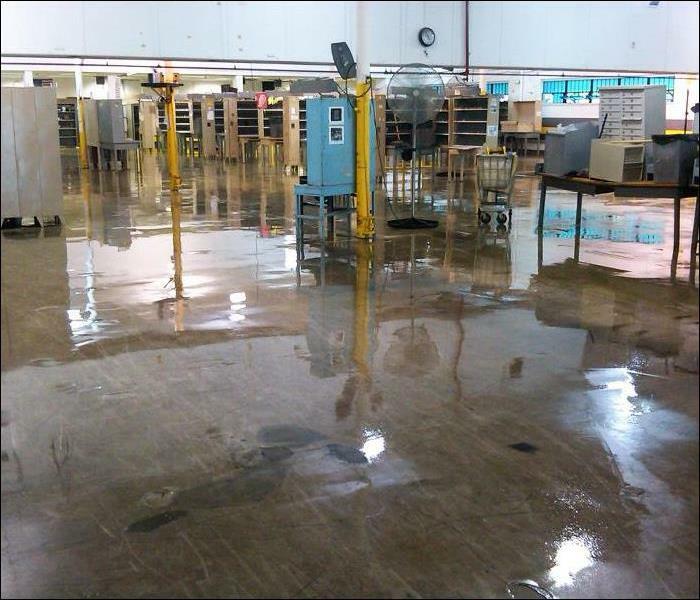 Flood Damage in this local large scale Commercial Building left a good amount of standing Category 3 unsanitary black water that affected the structure and building contents. 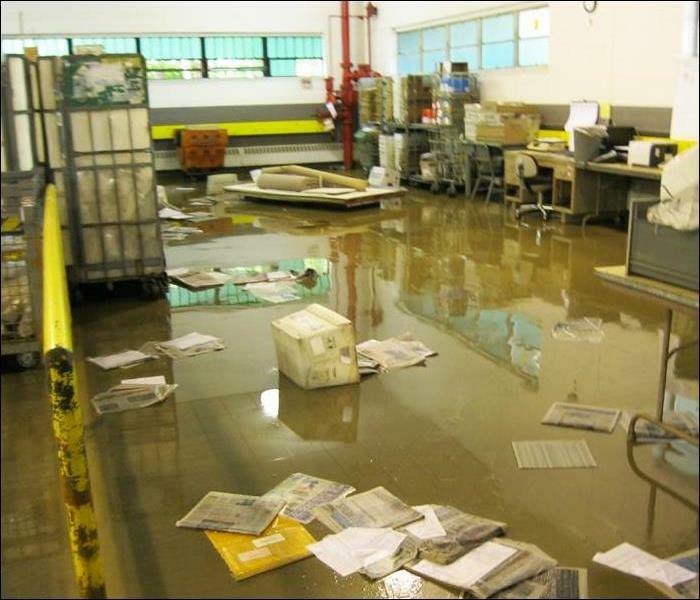 This main warehouse room required content manipulation, the removal of furniture, and debris disposal before and during the wet-vacuuming water extraction process. 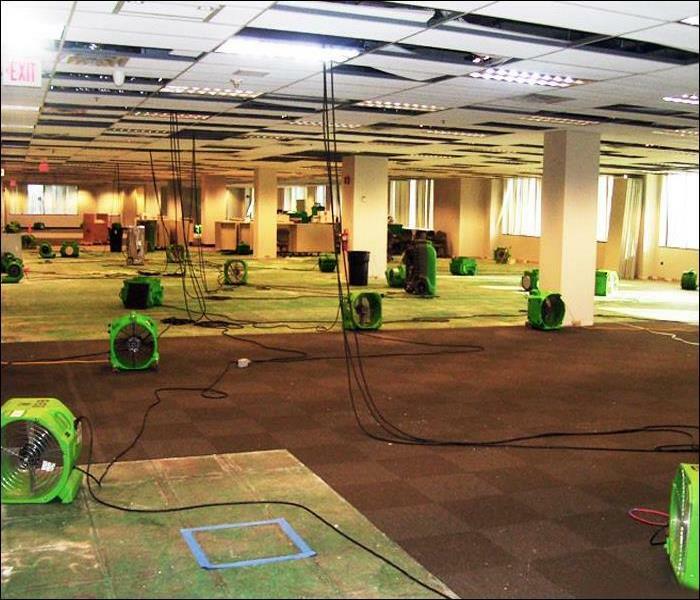 Once the water was removed SERVPRO of Northern Sussex County’s cleaning technicians began the extensive mopping, clean-up, and disinfection of all of the floors and 2 foot wall perimeters, before the set-up and monitoring of the drying equipment could be put in place. 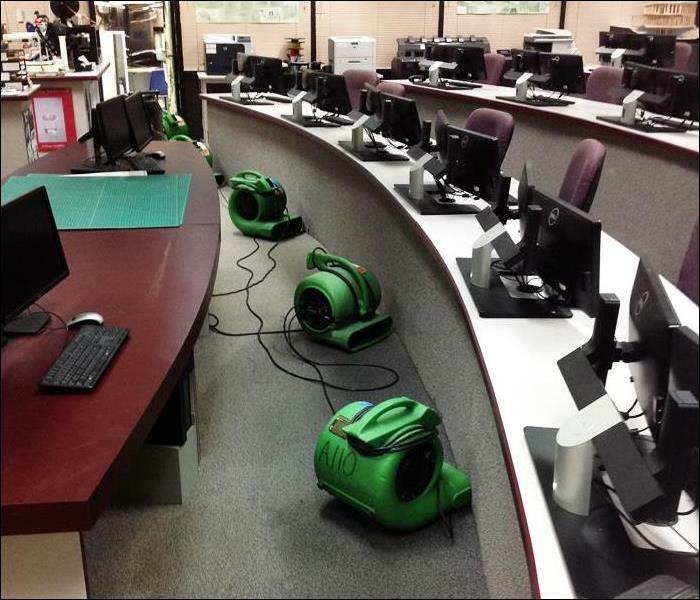 SERVPRO of Northern Sussex County quickly got this room back to preflood conditions so it could reopen for business. After severe storm weather, a creek over-flowed and completely flooded the surrounding land and inside of this local large scale Commercial Building. The flood caused an extensive amount of standing Category 3 unsanitary black water that affected the structure and building contents. 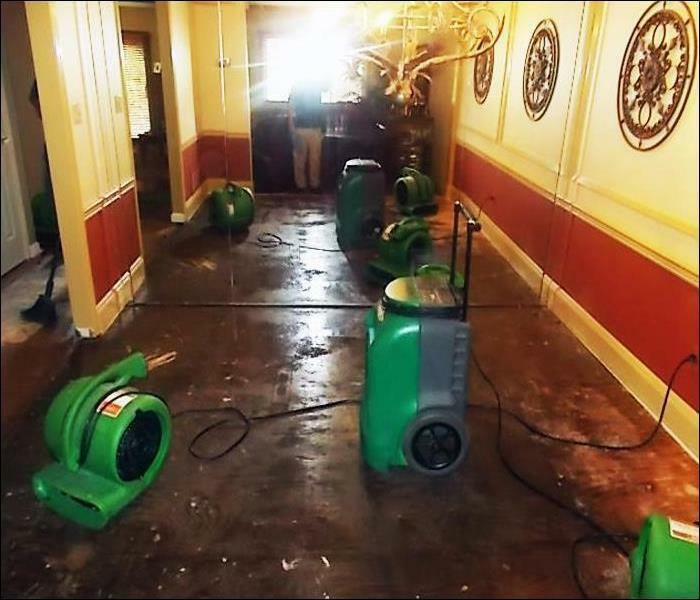 Once called, SERVPRO of Northern Sussex County immediately responded to the emergency situation and started the water extraction and clean-up process once the flood waters started to recede. The process involved the manipulation of contents, debris disposal, and the use of the proper SERVPRO commercial grade pumps and water extraction equipment. During the heavy clean-up and disinfection process, heavy generators, commercial fans, air movers, dehumidifiers, and large scale truck mounted drying systems were put into place to prepare the closed down building for the next renovation step. This photo shows the results of the damage that can happen after an unexpected heavy rain storm. 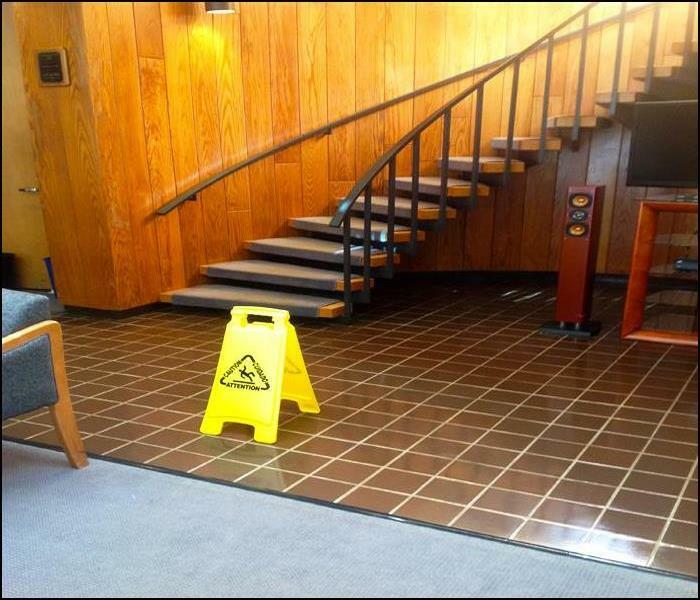 After severe weather this building’s lobby was flooded with standing Category 3 hazardous black creek water. 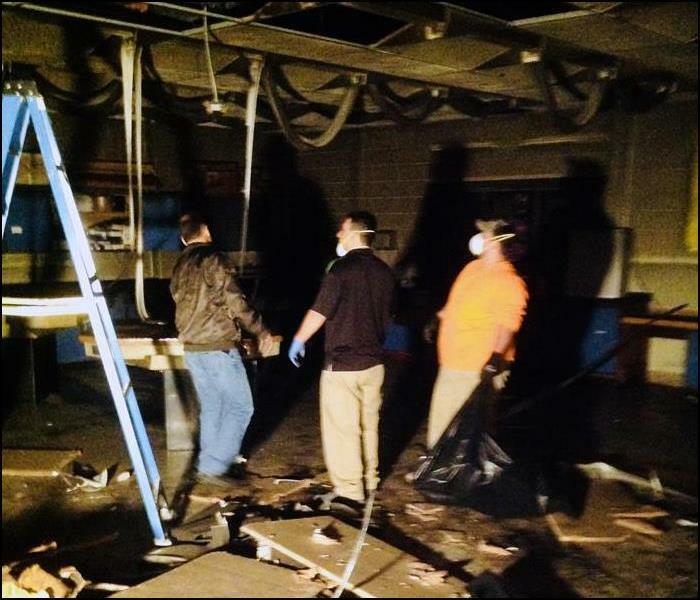 After the waters receded the retail space was left with a large amount of unwanted dirt, silt, and debris that would require an extensive amount of clean-up and proper disposal. 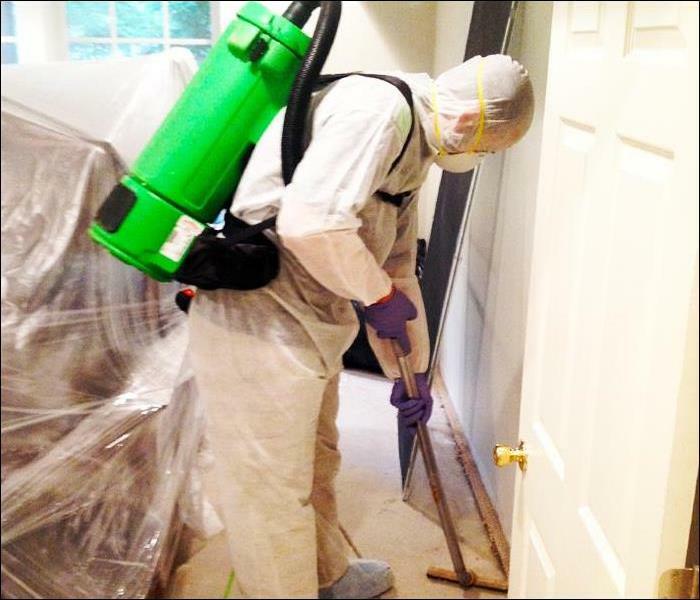 SERVPRO of Northern Sussex County was called in to quickly provide 24-hour EMS Emergency Services for remediation of the entire building, with technicians that are fully trained to safely handle hazardous contaminated materials, and any size disaster. 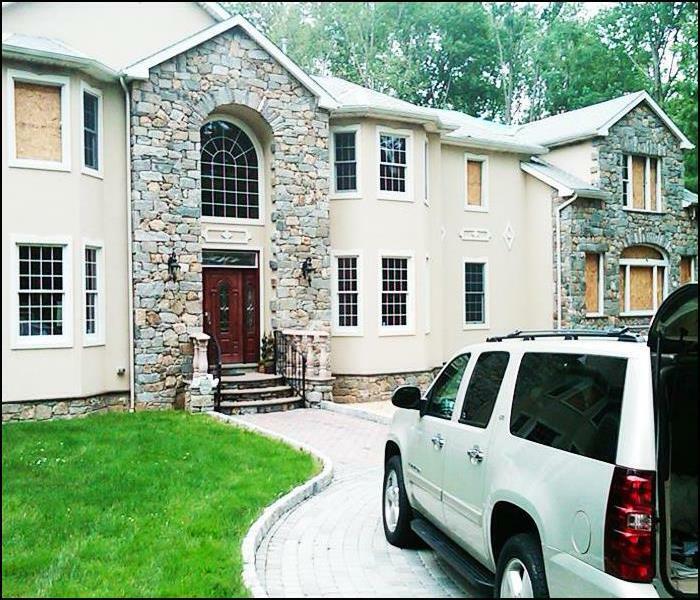 SERVPRO of Northern Sussex County provided Immediate Board-Up Services for this past residential home fire, located in Stockholm, NJ. 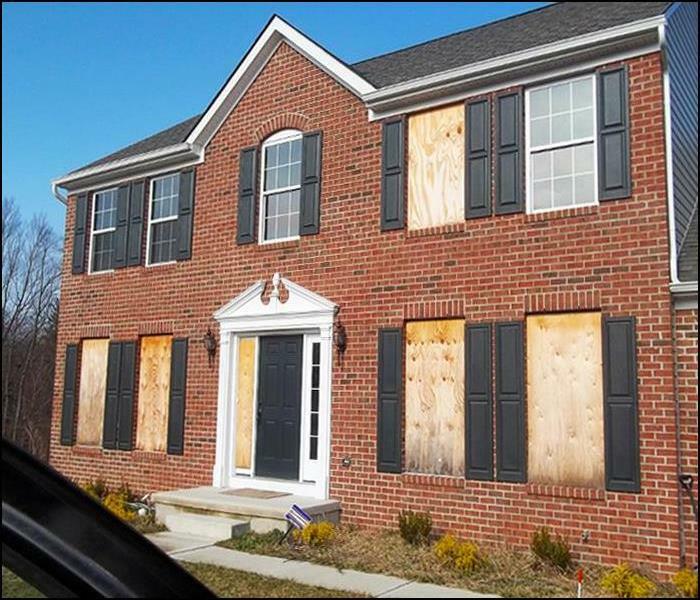 Fire damage can often compromise windows, walls, and roofs. To maintain security and to protect against further damage, we can board up missing windows and walls and place tarps on damaged roofs. If you Have Questions About Fire, Smoke, or Soot Damage? Give us a call at 973-383-2024. 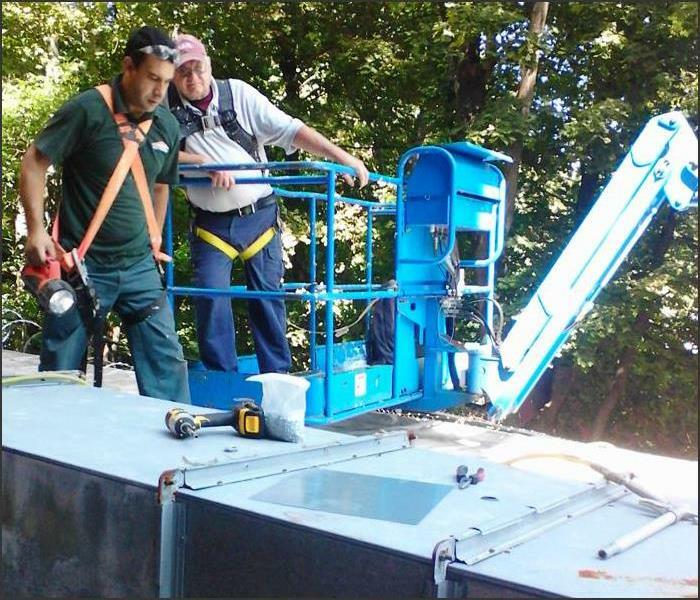 SERVPRO of Northern Sussex County Technician Daniel gets a lift to the top of a local building in Newton while he works on a Commercial HVAC/Duct Emergency Services Cleaning call, which was needed due to an interior mold remediation, rebuild, and clean-up. 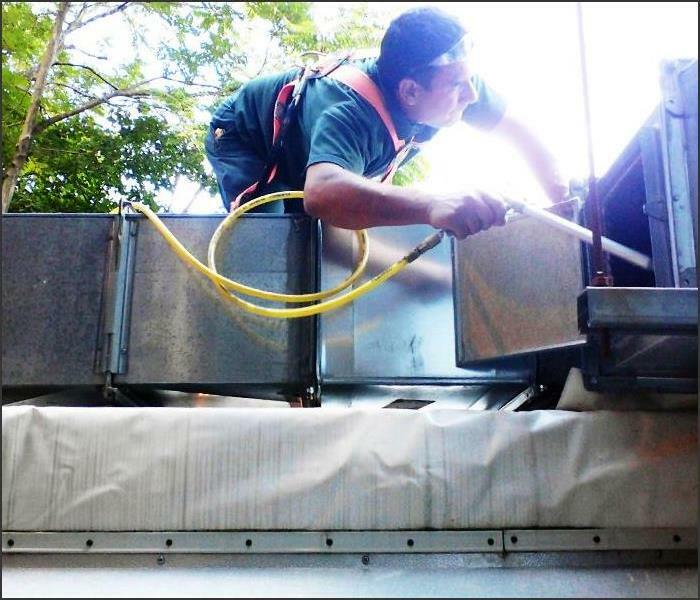 Technician works to clean and sanitize a commercial HVAC/Duct System, post construction, due to mold spores that were present in the building before heavily damaged sheet rock was remediated. The mold formed when water leaked into damaged window frame headers. SERVPRO of Northern Sussex County sets up equipment for the cleaning of this commercial HVAC/Duct System, as part of a mold remediation and construction rebuild. Time was of the essence to get this emergency service called handled quickly so that the occupants could safely go back to work in the building. Image of our equipment hook up into duct work. 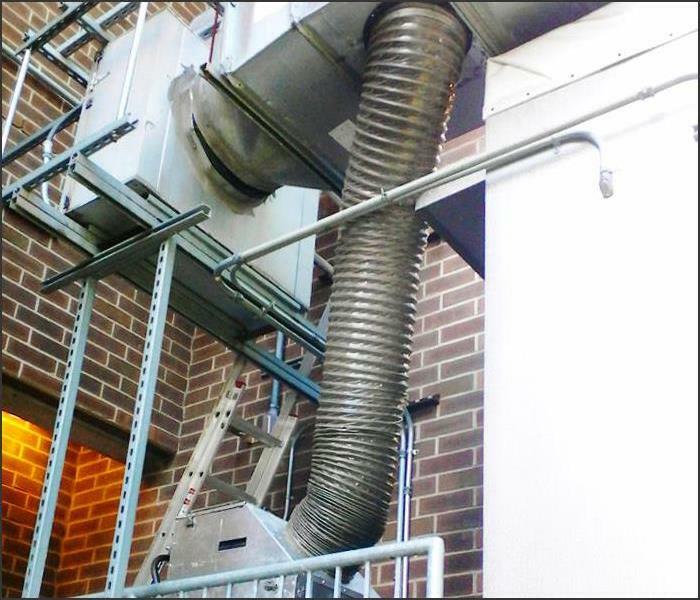 We provide both residential and commercial Air Duct and HVAC cleaning services. This includes retail facilities, education facilities, property management, healthcare facilities, hospitality facilities, food service facilities, and residential homes. 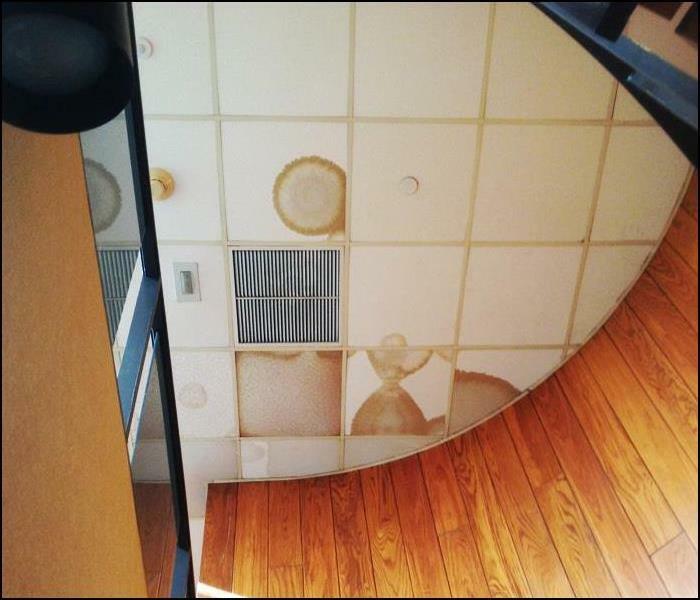 This image shows water damaged ceiling tiles inside an occupied commercial office building located in Wayne, NJ after heavy rains created roof leaks into the space. The floor and stairwell beneath the area became wet and SERVPRO of Northern Sussex County was called out to clean and dry out the carpeted stairs and tile flooring beneath while the roof was being repaired. After heavy rains, SERVPRO of Northern Sussex County was called out to cleanup and dry out the carpeted stairs and tile flooring beneath an area where the roof leaked inside this commercial office space so that the heavily traffic area could open back up for operations. Mold will form fast after a water damage occurs if the affected space is not dried out in a timely manner. 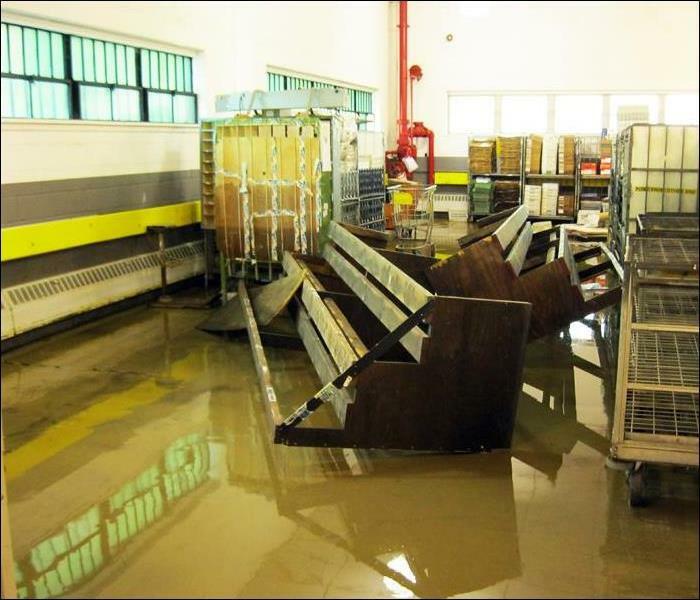 This is the beginning stages of a commercial emergency water damage, which involves content manipulation, water extraction, removal of unsalvageable wet contents, and the setup, placement, and monitoring of drying equipment. This image shows the floors in one of the main student areas of an Elementary School after they were cleaned, waxed and polished during a detailed post construction remediation and cleaning job by one of SERVPRO of Northern Sussex County’s professional cleaning crews. 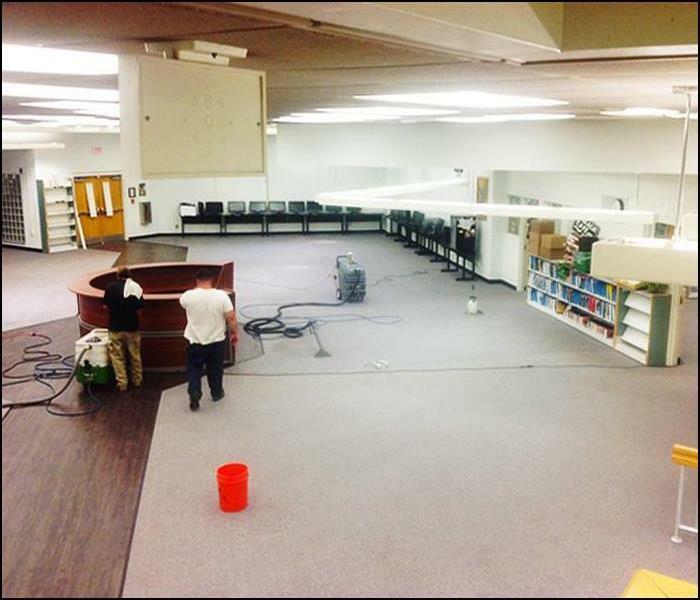 SERVPRO remediated and performed a detailed cleaning of construction dust and debris inside the main student areas of a large elementary school. 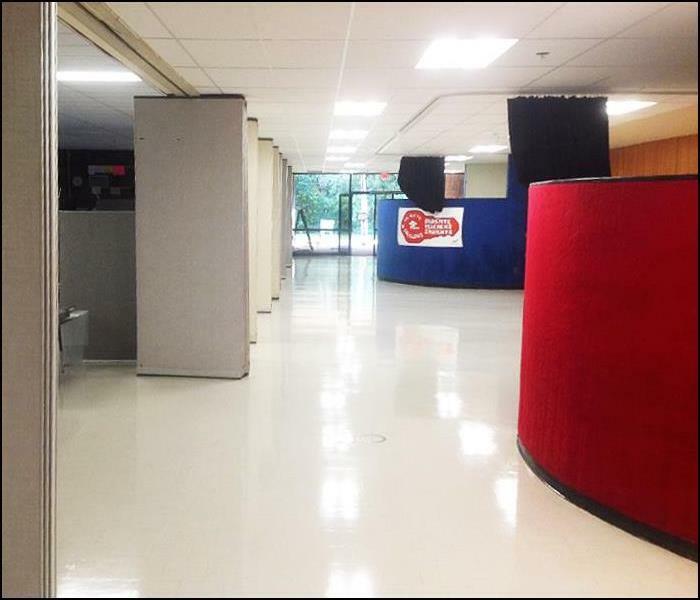 This included the Cafeteria, Entryway, Gymnasium, Instrument Room, and all Common Hallways. 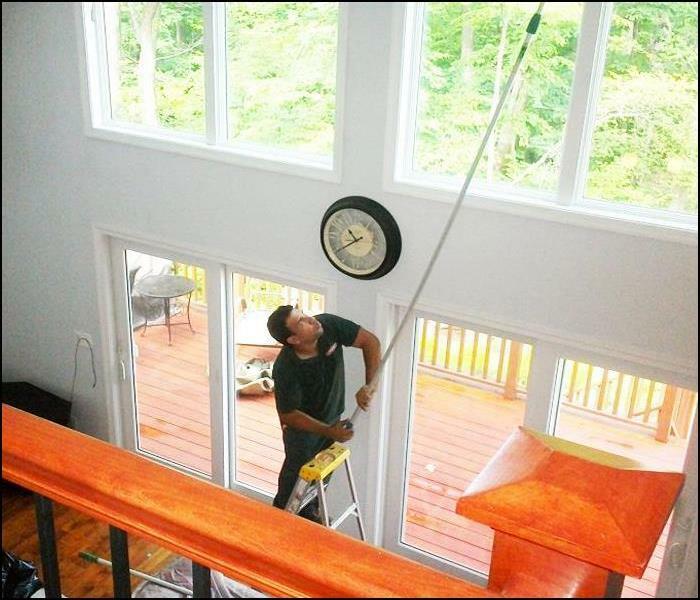 SERVPRO technicians have the specialized training and products to get your home or building completely restored, servicing both Commercial and Residential cleaning projects. 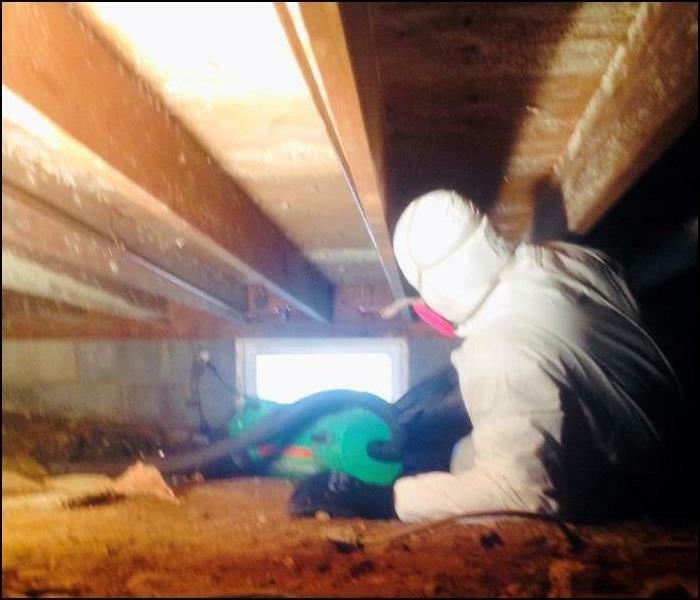 SERVPRO of Northern Sussex County performing a hazardous waste clean-up, in a local residential attic, after it was discovered that invasive bats moved in. 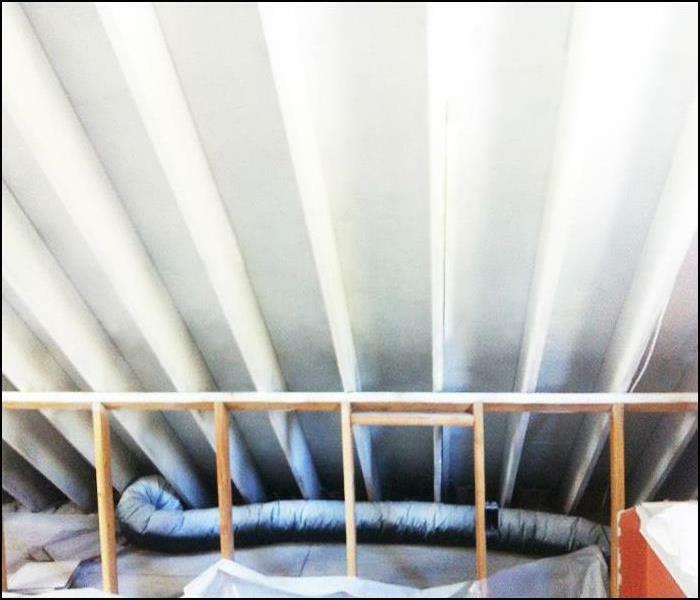 Using proper industry standards, guidelines, and safe practices for dealing with hazardous materials, our technicians were able to successfully remediate the entire attic space. 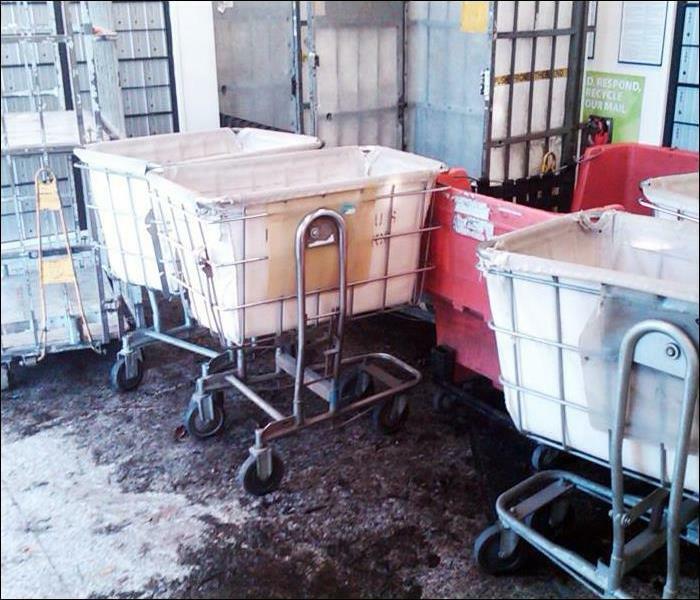 This involved safe contaminate removal, bagging, and disposal, along with detailed Hepa-vacuuming, heavy cleaning, and rounds of disinfectants. This is an example of the drying requirements resulting from a frozen sprinkler head discharge at a Vernon NJ Hotel. Drying equipment and air scrubbers are seen in place here to ensure a dry, healthful condition is returned for this hotel's occupants. This home in Stockholm NJ required a pack-out and storage of all items in order to prepare the home for restoration. We photograph, carefully wrap the contents and serial code each tag to to ensure an accounting of all items removed from the home. The finished floor glows after SERVPRO completes this general cleaning at a Rockaway, NJ school. 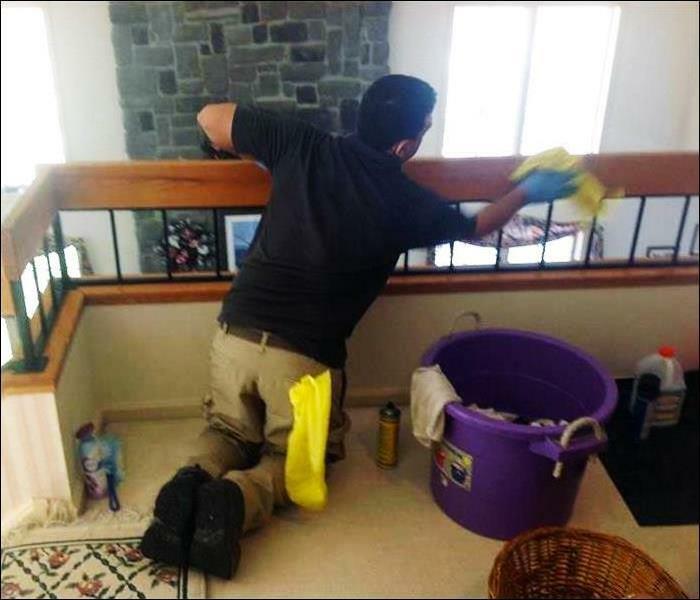 Our technicians are trained in the proper care and cleaning techniques for all hard surface flooring.